Ok….this weekend has not been a total bust. I did teach myself, using a YouTube Video, how to navajo ply. It makes a well balanced yarn if you keep a good rhythm. This is the video I found the most useful. There are other videos out there if you don’t find it helpful. I have had this puppy since I was like 2years old. 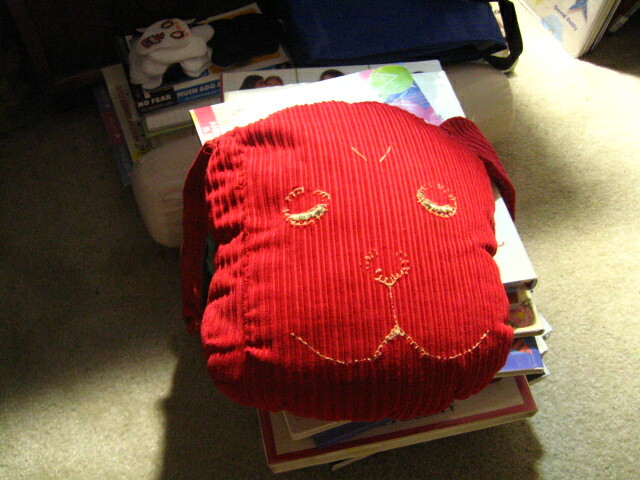 He is made from a super soft red corduroy. He use to have felt eyes, nose and tongue, but they have long since been loved away. The inside of his ears are flannel and it has been worn as well. This puppy use to have a mate, but I think that one was extra loved or tackled at one point by an actual 4 legged puppy and destroy.